UN Security Council approves resolution requiring UNIFIL to take action against Hezbollah. Israel’s Ambassador to the United Nations, Danny Danon, on Wednesday welcomed the adoption of a new UN Security Council resolution regarding the mandate of the United Nations Interim Forces in Lebanon (UNIFIL). According to the decision made upon the annual renewal of this mandate, UNIFIL is now required to expand its reports to the Security Council and take deliberate action against Hezbollah’s violations. UNIFIL’s presence on the ground will increase significantly, and troops will be required to tour the Hezbollah-controlled areas of southern Lebanon. UNIFIL must also report all instances of Hezbollah’s violations and attempts to deny access immediately. "This is a significant diplomatic achievement that could change the situation in southern Lebanon and expose the terror infrastructure that Hezbollah set up on the border with Israel," Danon said on Wednesday. "The resolution requires UNIFIL to open its eyes, and forces it to act against Hezbollah's terror buildup in the area. We will continue the fight against Hezbollah and ensure that UNIFIL fulfills its duties on the ground,” he added. The Security Council’s decision includes two main elements: Higher presence of forces on the ground and reliable and timely reporting. Until now, and especially in the last few years, UNIFIL forces have rarely patrolled the area in southern Lebanon, refrained from entering villages widely agreed to be Hezbollah terrorist strongholds, and failed to report Hezbollah’s violations in real time. As such, from now on, UN forces will be required to demonstrate a robust physical presence on the ground, to enter every village and to report, in real time, Hezbollah’s violations of Security Council Resolution 1701. In addition, this landmark decision will dissolve Hezbollah's longstanding attempt to be seen as a legitimate organization within the international arena. The approval of this decision comes after many months of intense diplomatic activity by Israel’s Ministry of Foreign Affairs and the Permanent Mission of Israel to the UN, led by Ambassador Danon. This past June, U.S. Ambassador Nikki Haley visited the Lebanese border and was briefed on UNIFIL's limited operations and the arming of Hezbollah by Ambassador Danon and Deputy Chief of Staff of the IDF, Aviv Kochavi. 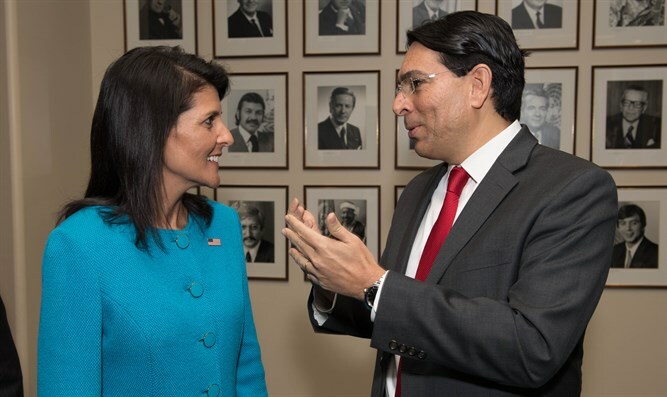 Since the visit, Ambassadors Haley and Danon have insisted on changing the mandate to the other members of the Security Council. As part of these efforts, Israel revealed classified materials to representatives of the various member states, and senior IDF intelligence officials delivered security briefings to UN ambassadors per Ambassador Danon’s request.